In 2016, around 44 percent of Americans claimed to eat at fast food restaurants at least once per week, with six percent eating there daily. So, where is the room for healthy dining? 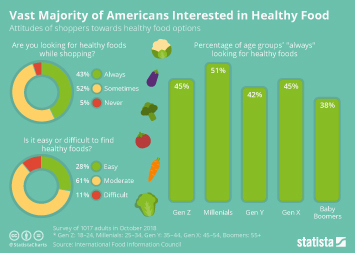 A survey conducted in May 2016, found that while taste and price remained the most important factors when it came to food and beverage decision making, healthfulness came third with consumers ranking it above convenience and sustainability. More than 80 percent of U.S. consumers reported that healthy options on the menu played some role in their decision when choosing a restaurant in 2016. However, it is was not just the nutritional value of the meal which was considered important – the consumer also wanted socially responsible restaurants that offered free-range meat, without antibiotics or steroids, and natural, organic ingredients. Restaurants are making an effort to cater to the demand for healthy dining: 61 percent of restaurant operators planned to offer more light or low-calorie dishes in 2014 and 59 percent planned to introduce more gluten-free options. According to chefs, healthy kids’ meals, and protein rich and ancient grains would be some of the leading restaurant menu trends for 2017. Topic: Eating behavior in the U.S.
Topic: Eating out behavior in the U.S.
More interesting topics from the industry "Restaurants"